The political action committee (PAC), called Vision PAC, was quietly registered with the Federal Election Commission (FEC) on October 4 by Inslee’s Washington state campaign treasurer Philip Lloyd. The existence of the PAC and its connection to Inslee have not been previously reported. So far, the PAC has reported a single $5,000 contribution from Yakima attorney Blaine Tamaki, a major Inslee supporter who the governor appointed to the University of Washington Board of Regents in 2017. Tamaki did not immediately return a call seeking comment. Another longtime Inslee donor and supporter, Janet Pauli of Bainbridge Island, told the news outlets that she and her husband Bill recently pledged $10,000 to Inslee’s federal PAC after he personally called to request their support. 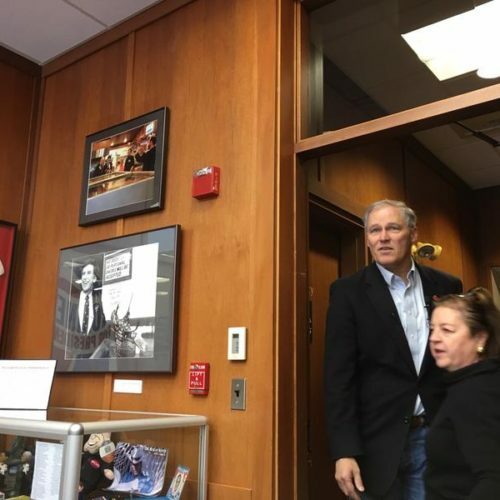 Pauli said that during her lengthy conversation with Inslee, he mentioned using the money he raises to make trips to states like Iowa, New Hampshire, Nevada and South Carolina that hold the earliest presidential primary and caucus contests. 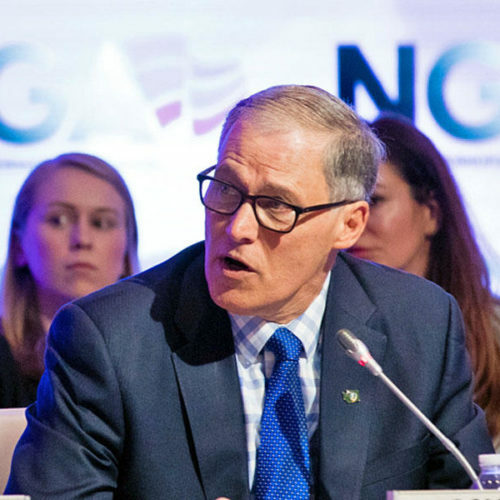 Inslee’s federal fundraising effort offers the most concrete evidence to date that the two-term Democrat, who is concluding his one-year term as chair of the Democratic Governors Association (DGA), is seriously considering a bid for president following months of speculation. Inslee campaign spokesman Jamal Raad said Friday that Vision PAC would be used by Inslee “to house his political activities that aren’t directly related to his reelection” as governor. But Raad said Inslee “has not made up his mind” about running for president and “has no current plans to travel at this time” to early voting states. Still, a Seattle-based Democratic consultant who asked not to be identified said the early signs suggest Inslee is a likely candidate for president. “It’s clear at a minimum that he’s considering it extremely seriously,” the consultant said. According to the FEC, potential candidates for president are allowed to raise money for purposes of “testing the waters” without formally registering as a candidate or forming a campaign committee. Pauli said she believes Inslee has what it takes to be president. “I would aboslutely trust our country in Jay’s hands,” she said. But she also said she’s willing to financially support him as a candidate even if he doesn’t have the horsepower to ultimately win, because it could open other doors, like a cabinet position in a future Democratic administration. “It could catapult [Inslee] to a higher level national position and that is exciting to me because I think he has a lot to offer,” Pauli said. In recent weeks, Inslee has inched closer in interviews to confirming he is a likely candidate for president. “I have not ruled that out, as you know,” he told The Seattle Times after the November election. In October, Inslee told Politico.com that the Democratic Party should “produce a candidate who’s going to really be committed to climate change and defeating climate change and creating a clean energy economic message and clean energy jobs.” Combatting climate change and sparking a clean energy economy are signature issues for Inslee who published a book on the topic in 2007 when he was in the U.S. House. 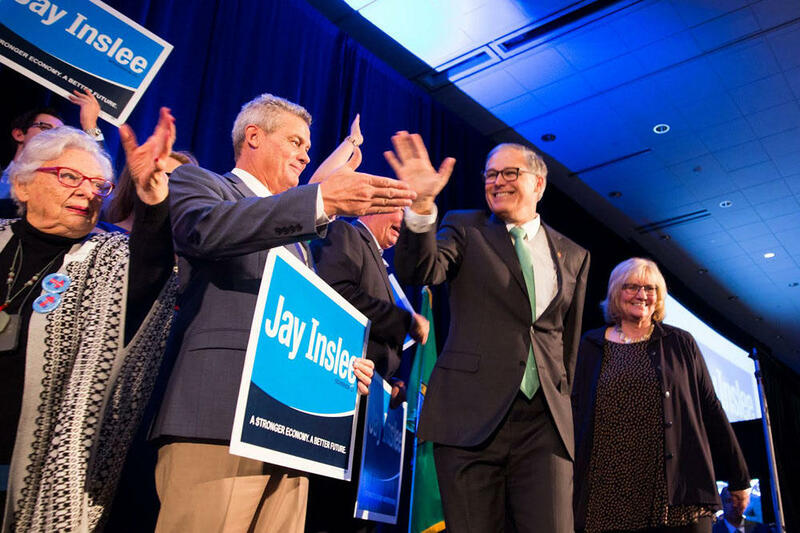 There have been other signs since the election that Inslee is actively exploring a possible presidential run. Earlier this week, he traveled to California to meet with unnamed political supporters. On that same trip, he made an unannounced visit to the fire-devastated town of Paradise. In a nighttime video posted to Twitter, Inslee stood in front of an acute care center that burned to the ground and called out President Donald Trump for his views on global warming. “You can’t stand here and say you don’t believe in climate change,” Inslee said in the video, which had more than 6,500 views as of Friday. This weekend Inslee is in New Orleans attending the DGA’s annual meeting during which his successor will be elected. Over the past year, as chair of the DGA, Inslee has significantly raised his national profile and emerged as an unrelenting critic of Trump. In February, Inslee made national headlines when he confronted the president at a White House meeting with governors over his plan to arm teachers. “We need a little less tweeting and a little more listening,” Inslee told Trump at the time. But it won’t be easy. If Inslee ultimate decides to run for president, he faces plenty of competition from Democrats with more name recognition, more access to cash and greater national standing. Even Pauli, Insee’s longtime backer, admitted to having her eye on Texas Congressman Beto O’Rourke who she met at a fundraiser in Seattler earlier this fall. “One of the first things I said is ‘he needs to run for president,'” Pauli said of O’Rourke. Inslee earned an honorable mention along with former Starbucks CEO Howard Schultz. As a candidate for president, Inslee would have to contend with a desire from young, progressive Democrats to see more women and minorities as candidates. “Jay is a 60-something white male and he has to overcome that,” said former Washington state Democratic Party chair Paul Berendt. Nonetheless, Berendt is among a number of Washington state Democrats who see more of an upside than a downside to a possible Inslee run for president. “He’s unique, he has a unique voice, he’s speaking to issues that no one else is embracing,” said Berendt, who is now with the public affairs firm Strategies 360. Berendt said he and his wife traveled to Iowa in May to watch Inslee headline an Iowa Democratic Party Hall of Fame event. Berendt said he made the trip “just to be supportive” and not because he has inside knowledge of Inslee’s future plans. Berendt also attended a recent fundraiser in Olympia for Inslee’s gubernatorial campaign committee. Another person in attendance at the Olympia fundraiser, attorney and former Department of Ecology director Jay Manning, had a different impression of Inslee’s comments that evening. 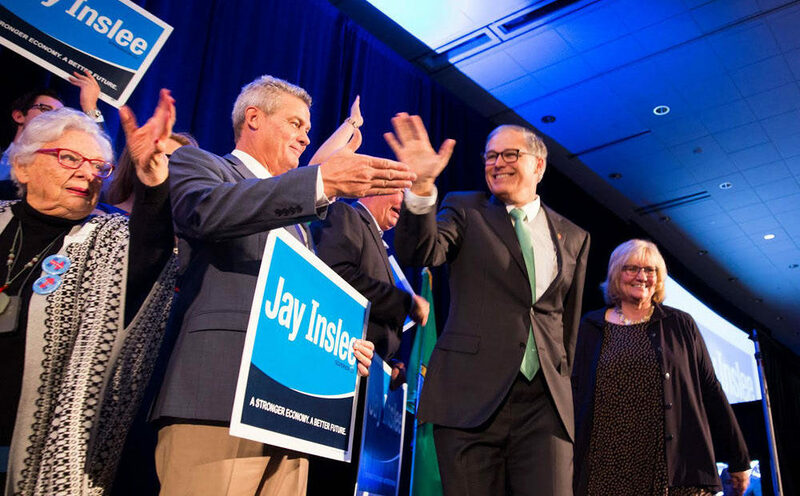 “He made a joke about it that was really inconclusive,” said Manning, a former president of the Washington Environmental Council who shares Inslee’s passion for addressing climate change. “The national dialogue on climate is so pathetic, to have a credible, presidential candidate elevate this issue and speak about it intelligently (…) would be a welcome antidote to one of the things that keeps me up at night,” Manning said. 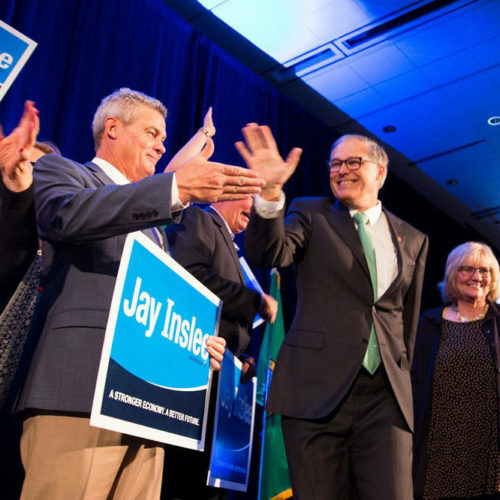 Lisa MacLean, a Democratic political consultant and principle partner at Moxie Media in Seattle, said stepping into the presidential fray seems like a natural next step for Inslee. “Running for president is an excellent way to multiply your opportunities moving forward on the national stage,” she said. The last serious presidential candidate from Washington was Senator Henry M. “Scoop” Jackson who ran twice in 1972 and 1976. In 1976, he won the Massachusetts and New York primaries, but dropped out of the race in May of that year after losing the Pennsylvania primary. Inslee, who has not ruled out a run for a third term as governor, continues to actively raise money for his state gubernatorial campaign in advance of a freeze on fundraising that kicks in December 15 before the start of the 2019 session in January. On Friday, his campaign sent out an email to supporters asking for contributions to meet a goal of raising $20,000 by midnight. As of October 31, Inslee’s campaign had $280,779 cash on hand, according to a report filed with Washington’s Public Disclosure Commission. It’s unlikely Inslee could use his state campaign funds for a federal race, but the so-called “session freeze” would not affect his ability to raise money during the legislative session for a federal race, according to a PDC spokesperson.